Cultu-ah on da way! This Friday! Washington Square UMC in its heyday–before it became condos for the wealthy. You can tell it’s still a church owing to the red doors (red doors mean the church mortgage is paid off, or so I’m told). 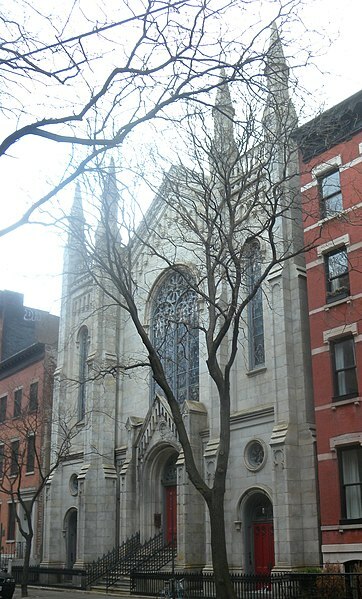 There was once this great church in Greenwich Village called WASHINGTON SQUARE UNITED METHODIST CHURCH. It drew me back to believing at a time when I had no use for religion, and it gave me access to an amazing and loving community. Alas, it is gone. It opened its doors before the Civil War and survived all sorts of traumas all the way up to the invasion of Iraq, but it could not survive the real estate wars–the gentrification of the Village. It is a huge missing piece in the current civil unrest that is part of the Occupy Wall Street movement. If it were still in place, I’m sure they would have been hosting events for the protesters. Anyway, I’m going to be talking about it/performing about it this coming Friday at the Museum of Reclaimed Urban Space, 155 Avenue C, New York, New York 10009. Tickets are $10 suggested, but people won’t be turned away for lack of funds. There’s information about the event here. Come see me. I’m bringing my guitar and my harmonica. And my stories.